As a judge for the upcoming Concours de Chien-Chaud, few people know more about hot dogs than Greg Papalexis. His grandfather Gregory, Senior was practically born into the business. When he was three years old, he lived next to a hot dog factory and above a hot dog bun factory on 115th Street in Manhattan. At the time, Gregory, Senior's father owned the two businesses, and Gregory, Senior used to play in the factories as a child. Greg comments, "One of [my grandfather's] earliest memories was getting smacked because he stole a frankfurter from the smokehouse." Eventually, Gregory, Senior branched out on his own and founded the New York City hot dog company Sabrett in 1959. Sabrett has been maintained as a family operation ever since—in addition to Greg working for the company, his father, two uncles, and two aunts are all involved in the operations. 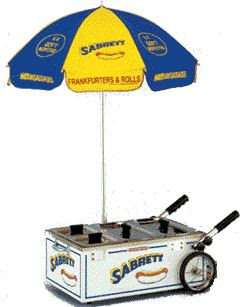 Nowadays, the blue-and-yellow-striped umbrellas placed atop Sabrett hot dog carts are recognizable on most any New York City street corner, shading the vendors of the city's own frankfurter brand. Sabrett sells over 20 million pounds of hot dogs each year (that's 180 million franks!). This year at The FCI hot dog contest, Greg will be a judge for the condiment competition, in which students will put forth their tastiest concoctions to accompany the hot dogs. As someone who knows a thing or two about hot dogs (he eats at least one a day), we can't think of anyone with stronger credentials! His favorite way to prepare a dog? Charred on the barbecue (he likes them well-done) and served on a Sabrett frankfurter roll with Sabrett mustard, onion, and sauerkraut on top. When Greg's not eating hot dogs, he will "pretty much eat anything: salads, cheeseburgers,Thai food…." His advice to the contestants? "Don't waste your appetite on the roll—the real food's the hot dog!"